Hi, I am interested in your 1956 Chevrolet Nomad (stock #2940-DFW) listed on Autotrader for $91,995. I'd like to get more information about this vehicle and confirm its availability. The long-standing admiration that classic car lovers have had for the model is only the beginning of this 1956 Chevrolet Bel Air Nomads appeal. Fresh off a through restoration both inside and out, it features a well-executed, high impact look thatll stand out in even the most well-heeled crowd of vintage cars, and this rare breed of Chevy will pull into its next owners garage with a collection of restoration photos in tow to document its transformation to its current outstanding state. Curb appeal isnt a strong enough term for this awesome wagon. Its already ultra-magnetic appearance is ratcheted up via its impressive finish, which includes a show stopping copper metallic exterior with white accents that culminate on its rear fenders. Featuring just the right amount of flake, the copper hue seems to have a life of its own - looking both sharp and a little understated in the shade, but shining like a diamond when basking in the sun. All the finishing details have been looked after to give this 56 a cut above vibe. The stout, Bel Air front bumper sits under an unblemished stainless-steel grille while just above, the Chevy emblem looks especially vibrant below the rocket-shaped hood ornament pointing the way forward. Fresh-looking headlights and taillights are surrounded by casings that look to have been installed recently and if you take a look in back, you cant help but appreciate how the rectangular tips of the dual exhaust peek out just the right amount from under the clean rear bumper. Nomads feature a lot more glass than their more common Bel Air counterparts and all of it on display here presents very well. As Clearly, a lot of thought and exacting work went into this build. While there are some well-chosen updates featured inside, none detract from the distinctive look that made Bel Air interiors among the most stylish of their era. Take your position behind the wheel and youll be surrounded by a saddle interior with white accents that shows a lot of impressive detail. The copper of the dash serves as a great backdrop for the length of chrome running the width of the cabin and the complement of Dakota Digital gauges residing in the fan-shaped instrument cluster. An underdash unit teams with a pair of in dash vents to circulate air conditioning through the cabin to keep everyone comfortable, while a vintage-look AM/FM/CD sits at the center of the dash to fill the interior with sound via an array of speakers that includes subwoofers hidden under the front bench seat. The storage area in back cuts just the clean appearance youd expect based on the rest of the car, with tan carpeting lining its floor and a full-size spare residing underneath its chrome-rimmed hatch. 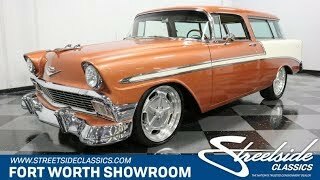 This classic Chevy has been serving as a worthy entrant on the car show circuit and features an engine compartment that certainly looks the part, but it also offers all the streetability you could want. A 350-cubic inch V8 sits inside, clad in black, armed with a 4-barrel Holley carb and Edelbrock intake to up its power game and featuring an array of top-tier components that include a polished air conditioning compressor, chrome power steering pump and a chrome alternator. The strong running power plant teams with a 3-speed TH350 automatic transmission thats at the top of its game and well up to the task of frequent driving in everyday conditions. Power steering makes navigation a breeze and power disc brakes at all four corners provide this stellar wagon with dependable, fade resistant stopping power as it cruises on its stare-inducing 20 Foose wheels that are outfitted with Nitto low profile tires. Offering a rare combination of magnetic curb appeal, very solid streetability and bona fide rarity, this 1956 Chevrolet Bel Air Nomad represents quite an opportunity. Call today!